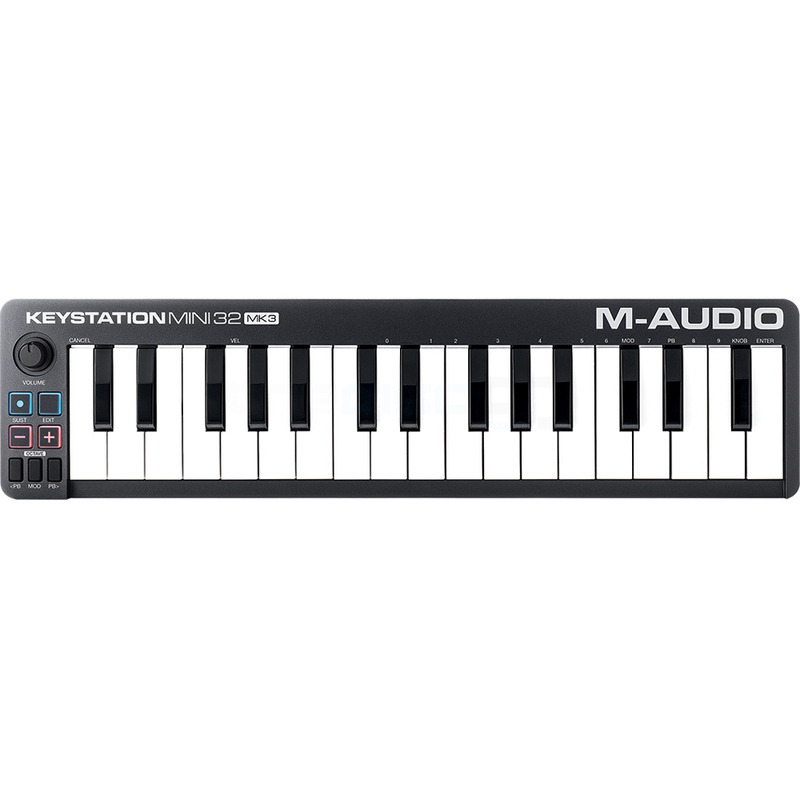 Enter the world of unrestricted computer-based music creation and performance with the Keystation Mini 32 MK3 keyboard controller from M-Audio - successor to the iconic Keystation Mini 32 II. Whether you’re a seasoned pro looking for just the right controller when you’re on the go or you’re looking to get started with the right mini USB MIDI controller, the Keystation Mini 32 MK3 is a simple, powerful MIDI controller designed for sequencing music and playing virtual instruments on your Mac or PC. Keystation Mini 32 MK3 features 32 natural feeling mini-size velocity-sensitive keys and comprehensive controls that expand the range of playable notes, expressive capabilities, and enhance your expressive possibilities. 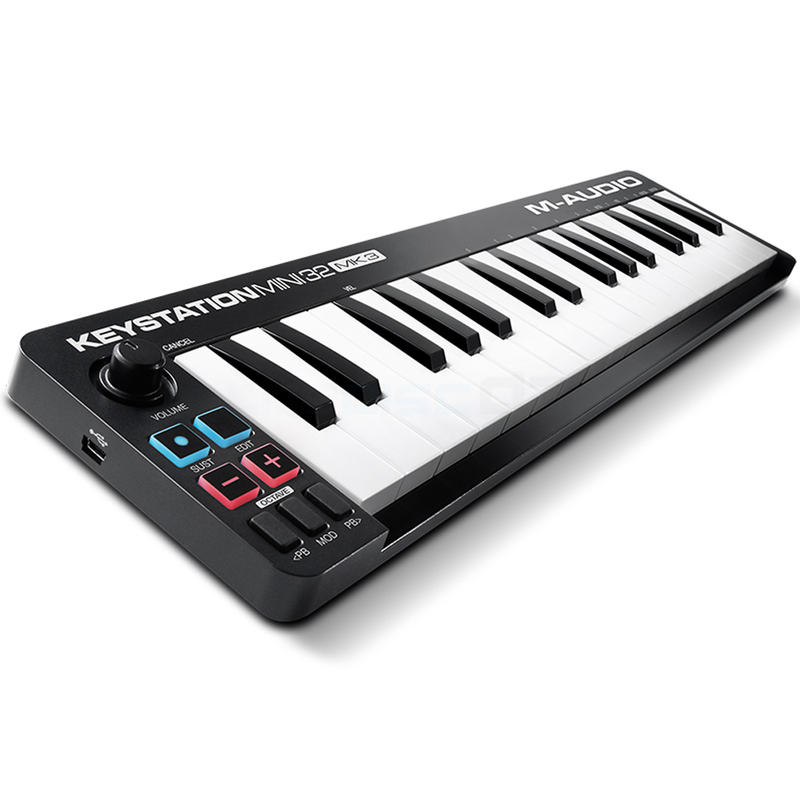 Keystation Mini 32 MK3 provides all the must-have tools to capture even the most immersive, expressive performances. Use the fully assignable octave range buttons, volume knob, dedicated pitch-bend and modulation buttons to play and perform with your music software. Keystation Mini 32 MK3 also features a sustain button for genuine piano sustain. 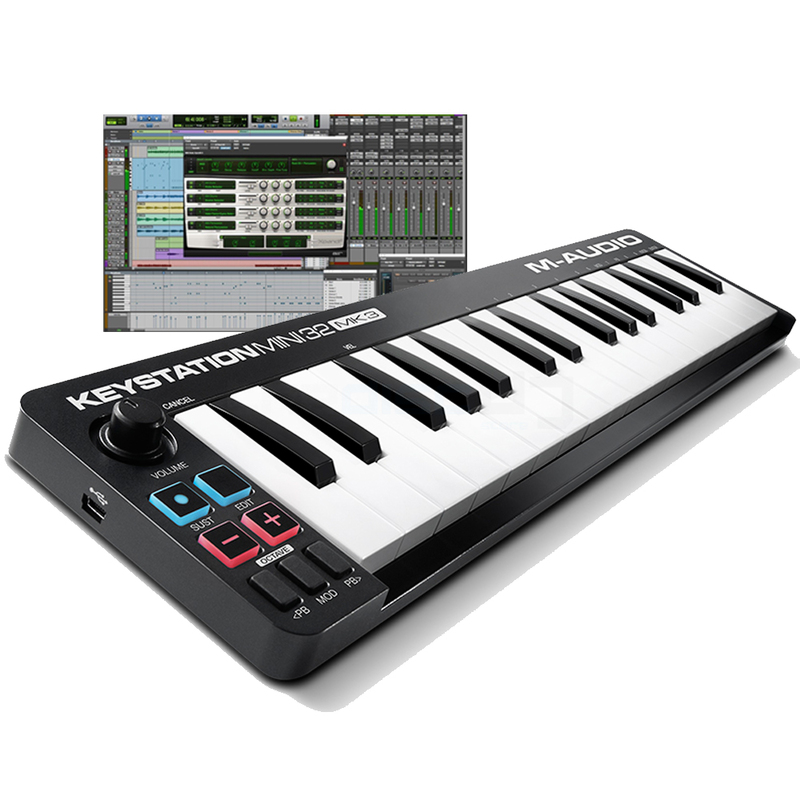 Lightweight and mobile, Keystation Mini 32 MK3 is perfect for travelling musicians who want to take command of music software during live performances or for producers who want to add an easy-to-use MIDI controller with a small footprint to their studio. For a simple portable setup, Keystation Mini 32 MK3 is USB-powered, class-compliant and supports USB-MIDI connectivity. Plus, Keystation Mini 32 MK3 supports iOS connectivity with the Apple Lightning to USB Camera Adapter (sold separately), enabling you to perform and compose with audio apps on your iPad and other iOS devices. Pro Tools | First | M-Audio Edition isn’t a stripped-down application. It’s based on the same music creation and audio production tools that award-winning artists, musicians, producers, engineers, and mixers rely on every day. All built on the rock-solid, great- sounding Pro Tools audio engine. Over 70% of all commercial music is produced using Pro Tools. Pro Tools | First opens the door to a career in professional music production. Start learning the essential workflows required to succeed in the industry.